WATCH THIS: Jew-Hater Rep. Omar Apologizes After Being Slammed; Some Dems DEFEND Anti-Semitic Remarks! However, Omar’s statement continued, as she stood by her criticism of the American Israeli Public Affairs Committee’s (AIPAC) special interest influence. “At the same time, I reaffirm the problematic role of lobbyists in our politics, whether it be AIPAC, the NRA or the fossil fuel industry. It’s gone on too long and we must be willing to address it,” Omar said. Many Democrats are speaking up after recent comments made by Omar. Some are refusing to condemn her, some are remaining silent while some are DEFENDING her anti-Semitic remarks. House Speaker Nancy Pelosi issued a statement signed by other Democratic leaders calling on Omar to “immediately apologize”, but refused to address calls to remove the repeat offender from the influential House Foreign Affairs Committee. 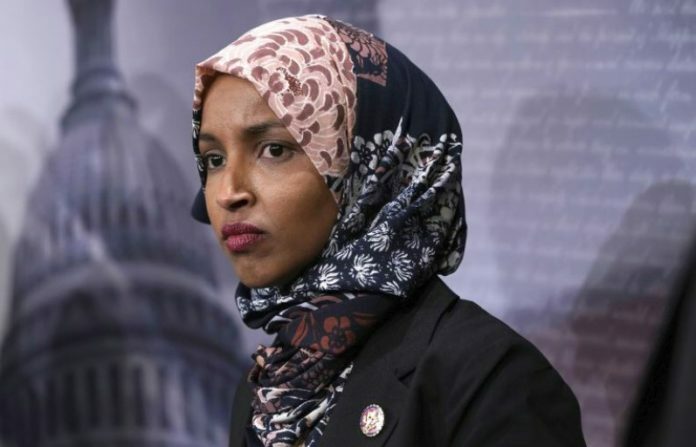 Omar, a Somali-American who became one of the first Muslim women elected to Congress in November, criticized the American Israel Public Affairs Committee, or AIPAC, in a pair of tweets over the weekend. “It’s all about the Benjamins baby,” she wrote, invoking slang about $100 bills. Some Democrats refused to condemn the remarks. One of them was interviewed on CNN on Monday morning. Her name is Debra A. Haaland from new Mexico. Haaland said “I don’t have a comment on that currently” and said she “does not” believe that promoting the idea that Jews control people with money is anti-Semitic. Another Democrat not only refused to condemn her remarks, but also DEFENDED her remarks. Rep. Dan Kildee (D-MI) in an interview on CNN on Monday morning: “I wouldn’t take it as anti-Semitism”. Republicans called on Democrats to strip Omar of her seat on the House Foreign Relations Committee, but Chairman Eliot Engel (D-NY) declined to do so. Engel’s statement said he would not tolerate the remarks, and found it “shocking to hear a Member of Congress invoke the anti-Semitic trope of ‘Jewish money.’” He said he will emphasize to members of the panel of both parties that the American-Israeli relationship is important. Meanwhile, it took Sen. Chuck Schumer an awfully long time to finally condemn her remarks. Schumer, the man who attends one Jewish event after the next, and brags about being the “(Schumer) Shomer Yisroel”, remained totally silent for nearly 24 hours. Not only is he the highest ranking Democrat in the country but he a JEWISH Democrat from our community. His short statement (released on Twitter) does not demand that Omar apologize, nor call for her to be removed from the Foreign Affairs Committee. Just last month, she defended the tweets, saying: “I don’t know how my comments would be offensive to Jewish Americans”. The controversy over Omar’s remarks stretched beyond Capitol Hill to the crowded Democratic presidential race. It a was a stark exposure of an increasingly tense split among Democrats over U.S.-Israeli policy ahead of the 2020 elections. None of the Democratic presidential hopefuls weighed in publicly as their party’s House leaders chastised Omar. You know @IlhanMN is a rabid hater when another vile Antisemite comes to her defense! Pelosi is hypocritical liar who does not mean anything she is saying , she just appointed Omar to the powerful House Foreign Affairs Committee last month, knowingly quite well Omar’s prior history of antisemitism. Democrats can not be trusted. This an-American foreign garbage should be deported back to Somalia with the first plane. The true colors of the a sizable portion of the Democrat Party. As if FDR and Jimmy Carter weren’t enough! Liberal Jews will vote themselves right into the camps. Somewhat the same problem the Republicans have. Two wings of a party with incompatible views on many issues, but they can only win an election by uniting. The Republicans have Trump’s populist wing (anti-immigrant, anti-trade, isolationist) and the establishment wing (pro-trade, pro-immigration, neo-con). The Democrats have the old fashioned Democrats (supporting liberal social programs within the Americans mainstream and supporting inclusion of all types of persons) and the new Socialist wing (favoring certain groups including Blacks and Hispanics and Gays, but bigotted against any group not deemed “politically correct”, opposed to private property, anti-free enterprise, and, most importantly for us, opposed to all religion but with a special concentration on anti-Semitism). There is a real opportunity for a middle of the road third party to win. Schumer has abandoned his Jewish brothers and sisters years ago. He is a total selfish idiot, and a dangerous one at that. Throw her out of the country. Deport her. And deport Schumer the same time. Schumer is the worst self-hating jew alive. Not sure why anyone is surprised. The Democrats are notorious anti-Semites. For ages. The were the biggest racists towards the black people many years ago. Check your history. They hate blacks, Jews and anyone else. Anyone notice that the dumb 12 year old Cortez is suddenly silent? The loudmouth bartender has suddenly lost her voice? What about that other anti-Semite, the Palestinian Thalib or something. What happened to her loud mouth all of a sudden? Where is Bernie the socialist now? Folks, remember this well. Democrats are a bunch of lying, sleazy, lowest trash of society. A bunch of rabid anti-Semites. I swear if she says one more anti semitic, we Jews will organize a huge march and do everything we can to get her out of Congress. I know we have free speech, but it is no longer free speech, now it is hate speech which is turning more people against us Jews! She is misleading people about us and there has been increased violence against Jews. Some forget that we are in golus and assume that in America we will be totally protected and insulated by the government and its citizens. Pittsburgh was indeed a severe wake up call to that. We must rely on the rachmanus of the Ribbono shel Olam and have sincere hakores hatov to those who actually demonstrate their support of us, from wherever it comes. If Pelosi and the others had remained silent, the critics would be screaming even louder. There is a mitzvah d’oraisa to have hakores hatov to Mitzrayim no less. rt, very tasteless of you by blaming it on “golus”. If this same issue occurred by a Republican or Pres. Trump, you’d be singing a whole another tune. As I’ve seen many of your comments through time, it’s safe to believe that you are first and foremost and liberal Democrat, followed secondly by a Jew. Just remember which party was the one that didn’t bomb the train tracks of Auschwitz, the party that brought a president (hint: Carter) who authored a book of the “Apartheid” situation with Israel- Palestine, the party of JFK and his ‘female shenanigans’, the party which places LGBTQ and pro-Abortion as top-party platforms, and the party who will bend over backwards to assist illegals at the Southern Border. I wonder how the Democrats would react if the Southern Border was the State of Israel, and not Mexico. Would they be as “generous”, “fair” , and “hospitable”? Doma, ‘I swear if she says one more anti semitic,” 80% Jews of Minneapolis will still support her no matte what. Did’we learn this sad lesson from Obama? I my gosh, I love it! you made a name typo that’s great! the remarks of most of the commenters are disgraceful They are hateful and they only arouse anti-Semitism. This Congresswoman was wrong and she apologized. When was the last time President Trump apologized for any of his hateful comments? And yet, most of the commentators embrace him . Truly disgraceful but sadly, this has become the mantra of so many of our brethren who have totally sold their soul to an orange pompadour. Chuck, Nancy, did i do it right? Rabbiofberlin, so we now know how this congresswoman really feels in her heart. I’m glad you accept her apology. I’m sure you accepted Germany’s apology too. We are very different people. I believe no apology in the world will bring back 6 million Jews. Apology not accepted! rabbiofberlin, i am very happy to see that you are so compassionate to “This Congresswoman ” and willing to forgive her past and present antisemitism who supports BSD and ISIS and still calls Israel evil. I just wish you extend the same to President Trump, the one you call “orange pompadour” who has done so much for Jewish People and Israel than nobody else in the WH done before him..
And the biggest request i have for you: please stop preaching the rest of us your “morality”, it is nauseating. moisheingolus- I am not compassionate to this Congresswoman and neither are scores of other Democrats who called her out in harsh terms!. No one is forgiving any of her anti-Semitic statements-this is pretty clear rom the backlash she faced- and for that she had to grovel and apologize. That is a good thing. As far as the President, you may change your tune when you see the “peace deal’ that his son in law and his attorney have concocted and that -as leaked- divides Jerushalaim and gives the Palestinians a state o the doorstep of Har Habayis, yes, a lot of good for the jews he is doing! Glad to see you became a Lamdan as well!! RT you are the same jerk as this Arab!!!!!! TGISHabbos: Have you ever heard of ‘wiedergutmachung” or are you too young to even know this term? Ask your parents and grandparents. And you are right- no apologies will bring back six million Jews but your attitude guarantees that Jews will be accused of crimes against humanity. Rabbiofberlin, you set such a good example of attitudes and respect when you call the president a orange pompadour. I didn’t like have Obama as president, but I certainly would never be immature or disrespectful to call him a nasty nickname or something racist, because he was president. Looks like the same rules don’t apply for you. TGISHAbbos- -First, if you did not address Obama with disrespect then you are to be commended-sadly-“puk mo amo diber’ go out and listen to the deep disdain that many Orthodox Jews ‘meanshei shelomeinu’ , had for Obama. So, yes, you can request from me that I address the present President with some respect- hopefully, we can expect the same from others on the opposite side. As far as the reason for the persecution of us throughout the centuries- of course it was, and is, because many in the world hate us. This is a given. And may I sat that the Congresswoman probably has disdain for Jews in her heart- my point was that she was criticized by every person of her party and many others for the terms she used.She had to grovel and apologize, which is a good thing. But there is no need for xenophobic attacks on minorities who came to the US for refuge. They are only doing what our parents and grandparents did. rabbiofberlin, I actually don’t think the Congresswoman or anyone in government should be forced to apologize- Republican or Democrat. If a politician truly feels a certain way, then (within certain measurable legalities) he/she can opine whatever they want. If she hates Jews or Israel, then say it, and no need for apology. The voters can and absolutely should decide. I believe most politicians called her out in order to protect their own Seats when the next election comes around. I don’t know how Congresswoman Debbie Wasserman (FL- D) really feels, but because her district is very Jewish it was wise for her to speak out against it. Was she forced? I don’t think so, and I hope not. I don’t live in the districts of this Congresswoman, but it’s safe to say that she would’ve lost my vote for eternity. I don’t think it’s a racist or xenophobic measure from me. Just as she has the liberty to say as she pleases, I have the liberty to vote for another candidate. Doesn’t matter if she were R or D.